front from left are Cybill Shepherd and Susan Anspach. Imagine a handsome loner, with a past, wandering back onto a large Texas ranch wrought with intrigue and deep dark secrets. Now, imagine Sam Elliott playing that dark, handsome stranger; David Soul playing a leading part; a young Cybill Shepherd as the vamp; and Susan Anspach as a more respectable leading lady. It makes for a can’t-miss premise doesn’t? Well it did miss. It was called “The Yellow Rose”, and it lasted a season on NBC, and CTV on peasant vision. 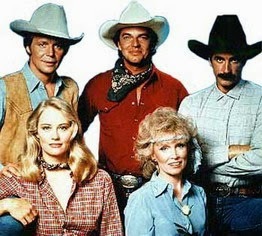 Debuting in 1983 amid a sea of other night-time dramas such as “Dallas”, “Dynasty”, “Knot’s Landing”, and “Falcon Crest”, it just didn’t seem to resonate with viewers. NBC was perpetually looking for a soap opera to match the success of all these others, but never really found it. “Flamingo Road” fell apart, and “The Yellow Rose” failed too. I had forgotten all about it, until I sat down in the public library recently and heard someone asking about signing it out of the library. It was not surprising the patron was informed it was not on DVD or anywhere else for that matter. After all, the show only lasted a handful of episodes, 22 in total. As I said it had all the makings of a hit, but fizzled, and was cancelled after one season. NBC did re-broadcast it in the summer of 1990, along with “Bret Maverick”, when there was some sort of writers’ strike on. “The Yellow Rose" was on at a time when NBC floundered in third place in the ratings, among three TV networks, and showed no signs of improving. The network had a revolving door of shows that were a victim variously of bad writing, bad acting, bad production, and sometimes just bad timing. “The Yellow Rose” falls somewhere in the middle of all this. It also fell victim to the rush of networks to capitalize on the popularity of night-time dramas, or soap operas. Many were either rushed into production, or at least looked like it, with premises that just didn’t resonate with audiences. Quite frankly, I was surprised anyone would remember "The Yellow Rose", like that lady in the library did. Yet, when I started to think about “The Yellow Rose”, I wondered what it would be like to see it 30 years later. After all, it did have an amazing cast.